The Electric Mistress is a guitar effects pedal made by Electro-Harmonix. It generates the so called flanging effect. 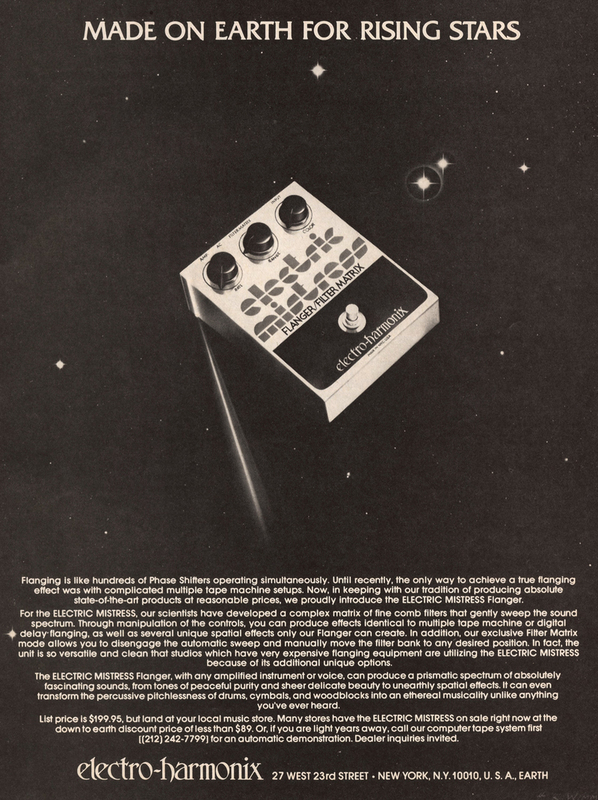 It was the first flanger for musicians which could be used live on stage. In 1968 Mike Matthews founded Electro-Harmonix in Ney York for producing and distributing guitar effects pedals. The first products had been the LPB-1 booster and the legendary Big Muff PI. 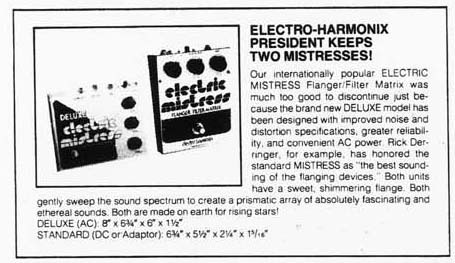 Probably 1975 or 1976 David Cockerell developed a flanger for Electro-Harmonix they named Electric Mistress . It was first sold in 1976. It very soon received a change in design of the case printing and the filter matrix switch had been added. Marketing for the Electric Mistress started 1977 with first ads published . The initial list price had been 199 US$. 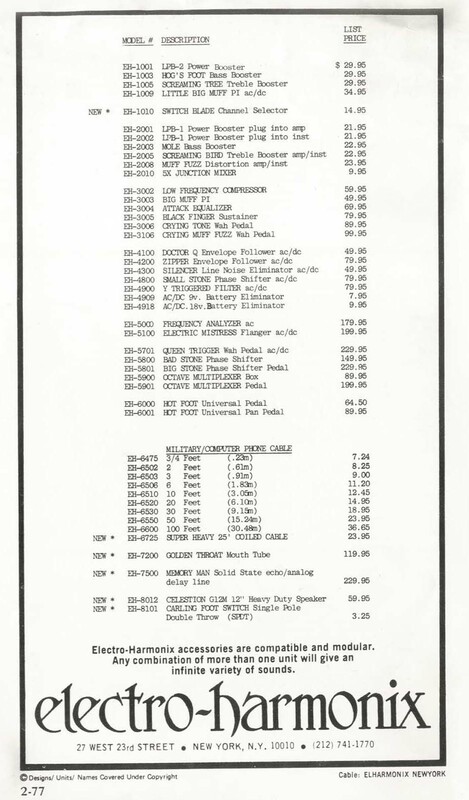 From 1977 to the 1982 the Electric Mistress was produced with only small changes to the schematic, but many different PCBs . In 1978 the Deluxe Electric Mistress had been designed by Howard Davis and introduced to the market. It was produced in parallel with the standard version. The Deluxe featured a larger case with integrated transformer and no battery connectors. The LFO and VCO had been changed to allow a wider range of settings. 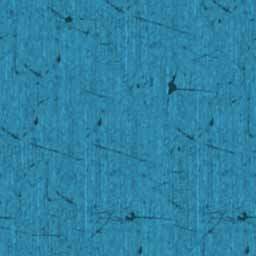 Further modifications had been added to reduce the noise level and to fix the volume drop. Trouble with labour union led to first bankruptcy of Electro-Harmonix in early 1982. But only a few months later Electro-Harmonix returned to production. The Electric Mistress had been redesigned by Howard Davis working now as a freelancer for Electro-Harmonix with a new LFO and VCO similar to the Deluxe and now ran on 9 V or a single battery instead of 18 V or double batteries like the former versions. In 1984 Electro-Harmonix went bankrupt for the second time which stopped production of the Electric Mistress and Deluxe Electric Mistress. Mike Matthews focused his activities on distributing electronic parts, mainly vacuum tubes, from Russia with his new company New Sensor Corp from 1988 on. Because of the high used marked prices the Electro-Harmonix pedals achieved he started production of some pedals in Russia under his new lable Sovtek in 1990. Prototypes of the Electric Mistress had been made in 1994 by Sovtek but were never sold . Matthews bought back the name rights for Electro-Harmonix and started selling so called reissues of his pedals made in USA in 1999. From 1999 on the Deluxe Electric Mistress had been reissued. Although Electro-Harmonix at that time wanted to make the reissues exact copies of the 1980s pedals they had to redesign the Deluxe Electric Mistress because its main integrated circuit, the Reticon SAD1024 BBD, was no longer in production. It's quite remarkable that the design of the reissue already had been made in 1995 by Howard Davis for New Sensor Corp .
From 2006 on Electro-Harmonix introduced several new designed pedals like the XO or Nano-Series. The Electric Mistress now became the NEO Mistress and the Stereo Electric Mistress. These new pedals are digital have nothing in common with the classic Electric Mistress and Deluxe Electric Mistress from a technical point of view and are not covered by this page. The original schematic escaped to the internet quoting "Original Drawing Dated 08/23/95/H.D." The most prominent user probably is David Gilmour (well, at least my favorite). By that time he was what nowadays would be called an early adopter and got his Electric Mistress V2 in 1976 or January 1977. It made its first public appearance on the Animals Tour and had mainly been used until 1983 for most recordings, especially to mention "The Wall" and again 1994 on the Pulse tour. For more information about David Gilmour and the Electric Mistress please refer to the outstanding gilmourish page. Listen to "Do Do Do Da Da Da" or "Driven To Tears"
Their album "All Rights Removed" is highly recommended for all Pink Floyd and/or Procupine Tree fans.